Maximilian “Max” Kruse (born 19 March 1988) is a German footballer who plays as a forward for Werder Bremen in the Bundesliga. He was born in Reinbek, Kreis Stormarn, Schleswig-Holstein in the north-eastern periphery of Hamburg. Kruse was raised in Reinbek or in Hamburg. He began his career with hometown club TSV Reinbek before he joined Hamburg-based SV Vier- und Marschlande in summer 1998. After more than seven years there, Kruse was scouted by Werder Bremen in January 2006. On 4 May 2009, he signed a two-year contract with FC St. Pauli. During the 2011–12 2. Bundesliga, Kruse scored 13 goals and provided six assists as FC St. Pauli finished on 62 points in fourth place, missing out on the promotion playoffs on goal difference. Following his successful spell with St. Pauli, Kruse was transferred to Bundesliga side SC Freiburg in the summer of 2012. He made his competitive debut for his new club on 18 August 2012 in a DFB-Pokal match against Victoria Hamburg, which ended in a 2–1 victory as Kruse scored the opening goal and provided the assist for Sebastian Freis’s winner. Kruse made his home league debut on 25 August, scoring a goal in Freiburg’s 1–1 draw with 1. FSV Mainz 05. Kruse helped Freiburg claim their first win of the Bundesliga season in their third game on 16 September, netting a goal and providing two assists in an enthralling 5–3 defeat of TSG Hoffenheim. Kruse helped seal an upset win over Schalke on 15 December, providing assists for first half goals to both Jan Rosenthal and Jonathan Schmid in a 3–1 away victory at the Arena AufSchalke. On 16 February, he opened the scoring nine minutes before half time as Freiburg recorded their first win over Kruse’s former club Werder Bremen in 11 years with a 3–2 away victory at the Weserstadion. Kruse netted twice in the second half of Freiburg’s Bundesliga clash with Borussia Mönchengladbach on 30 March, securing a 2–0 victory for the club. In Kruse’s penultimate game with Freiburg on 11 May, Kruse was awarded “Man of the Match” honours as he netted the winning goal in a 2–1 defeat of already relegated SpVgg Greuther Fürth, all but securing Freiburg an automatic spot in the Europa League group stage for next season. Following a standout season with Freiburg, Kruse signed for Mönchengladbach on a four-year deal in April 2013. Kruse made his debut for the club in Gladbach’s loss to 3. Liga side SV Darmstadt 98 in the first round of the DFB-Pokal on 4 August 2013. Kruse managed to score his first goal for the club on 17 August, firing in Gladbach’s first goal in a 3–0 home victory over Hannover 96. He continued his scoring form on 31 August, netting Gladbach’s third goal of a 4–1 home victory over his former club Werder Bremen. On 10 May 2015, VfL Wolfsburg signed Kruse on a four-year deal, after activating his release clause of €12 million. Kruse made his debut as a 69th-minute substitute on 1 August in the 2015 DFL-Supercup, and scored in the penalty shootout as Wolfsburg defeated Bayern Munich after a 1–1 draw. 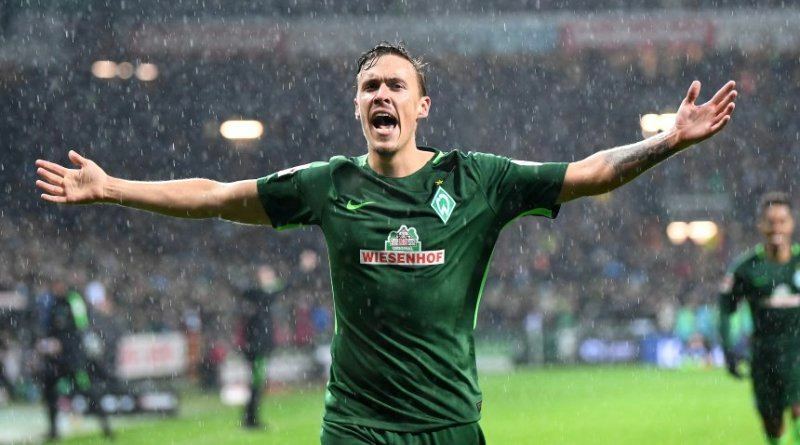 On 8 August 2015, Kruse scored his first goal for Wolfsburg in the 4th minute of 4–1 win at Stuttgarter Kickers in the first round of the DFB-Pokal. On 2 August 2016, he re-joined Werder Bremen for a second stint at the club. Kruse scored his first goal for the club in his third league appearance on 3 December 2016, in a 2–1 win against Ingolstadt. On 22 April 2017, he scored four goals in one match for the first time in his career as Werder Bremen came back from 0–1 and 1–2 deficits to defeat Ingolstadt 4–2 and maintain a 10-match unbeaten run. Ahead of the 2018–19 season, Kruse was chosen as the team’s captain by manager Florian Kohfeldt. Kruse was a member of the Germany U-19 that competed at the 2007 UEFA U-19 Championship and also featured for the under-21 team. He received his first call up to the senior squad for a friendly against Ecuador on 29 May 2013 in Boca Raton, Florida. He provided the assist for Lukas Podolski’s second goal of the match before being substituted for Dennis Aogo in the 79th minute. The match ended with a 4–2 victory. Kruse scored his first goal for the national team in his second cap, scoring Germany’s second goal in a 4–3 defeat to the United States in Washington, D.C. on 2 June, a game which celebrated 100 years of the United States Soccer Federation. Despite Kruse’s successful league campaign with Gladbach, he was omitted from the 30-man preliminary squad for the World Cup in Brazil. During qualification for UEFA Euro 2016, Kruse scored twice in a 7–0 win over Gibraltar on 13 June 2015. In September 2013, German tabloid Bild named Kruses’s camouflage Maserati GranTurismo as the ugliest car in the Bundesliga. He is an avid poker player and made it to the final table, finishing third, at the No-Limit 2–7 Draw Lowball event at the 2014 World Series of Poker on 18 June 2014, taking home $36,494 in prize money. In March 2016, he was fined £20,000 and warned of his future conduct by Wolfsburg after it was revealed that he had lost £60,000 worth of poker winnings in the back seat of a taxi.